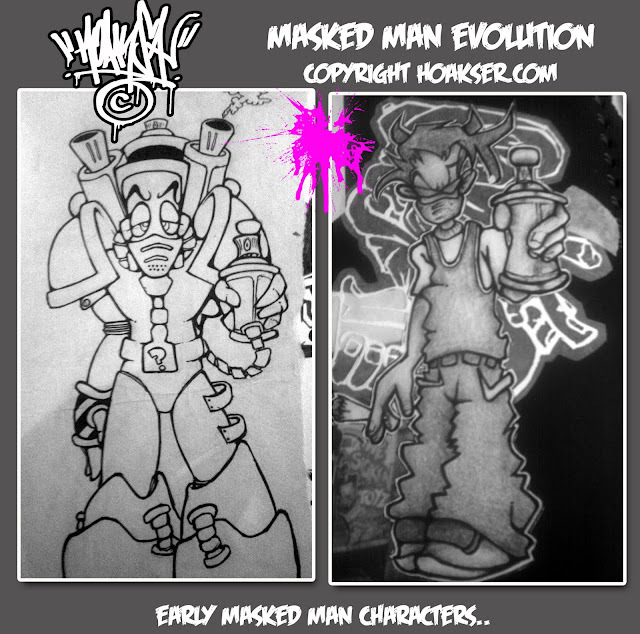 hoakser's blog: the masked man evolution and headrush prints..
the masked man evolution and headrush prints.. While mooching through loads of old outline books and boxes of drawings the other day, I started realising that my masked man character is older than I think.. I don't really know why I've chosen to draw this character so much over the years. 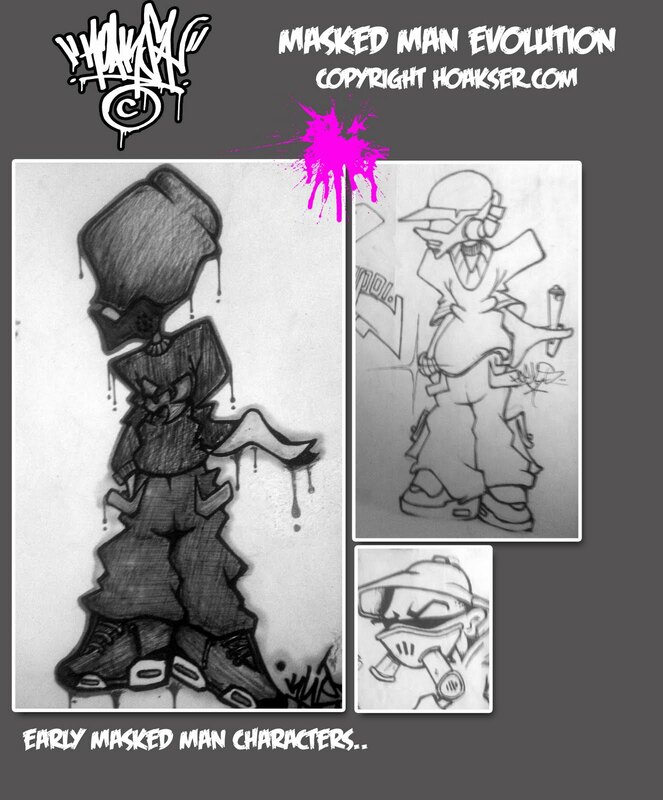 Going through loads of my old stuff, I realised that even my oldest characters had bits of them in development.. So I thought I'd share some..
Obviously now, but sub-consiously then, I was heavily influenced by Warhammer Space Marine figures and Bode style artwork. I went through a phase of painting space marine minatures, which looking back, was good practice for my toy customising I do today.. I've got books and boxes full of oldness so ﻿﻿I could fill pages of this with images of this character. So I've kept it brief...Thinking about it, I would love to know how long I've spent developing, drawing, designing, painting, printing and modelling this character so far.. The masked man has seen a lot more of the world than I have... Looking back now, when I started drawing those first few characters I had no idea what he would become or how far he might get to travel.. 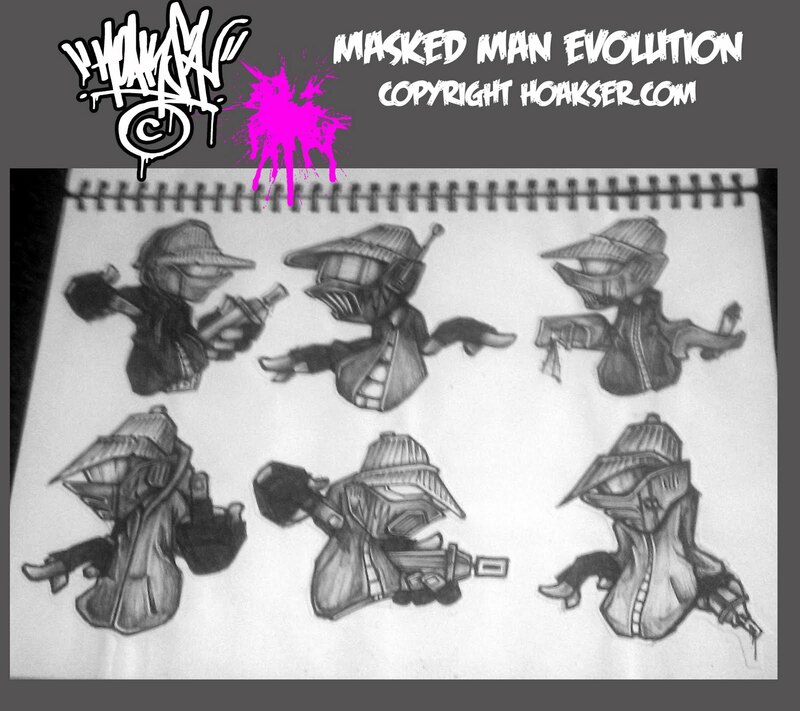 I've put the masked man image on all sorts of surfaces.. The munny on the left was customised in pen.. Straight up, hand drawn onto it in biro..No mistakes allowed.. The image below is probably one of the most abused, used, graffiti images on the internet.. Years ago it leaked off my website as it wasnt protected. Since then it has been used by thousands of people for various things.. In one way I'm glad people like it, and it does have my name on it I suppose. 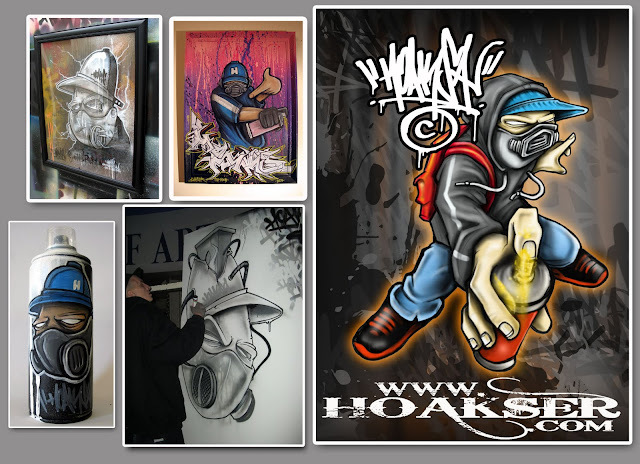 Google search hoakser images to see the extent of the useage..
MASKEDMAN limited edition resin cans.. 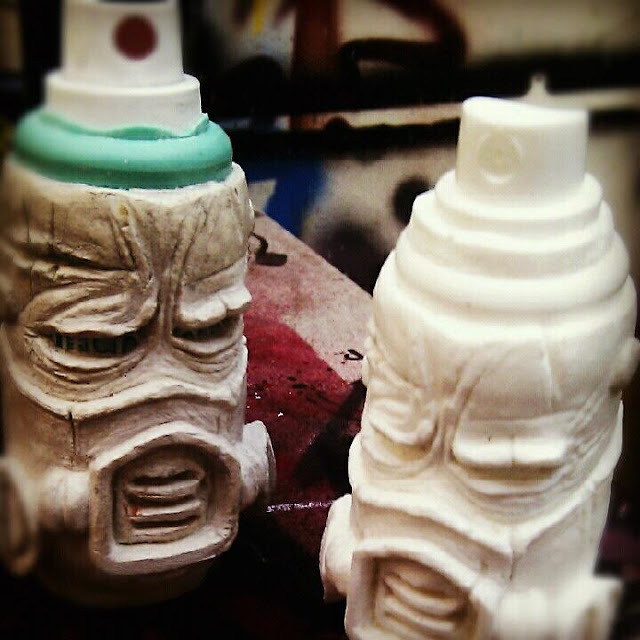 This is my first handcast figure I've released that is now available to Pre order in time for Christmas.. Supplied in a clear bag with an art card header, a unique art card for each piece which will be signed and numbered.. 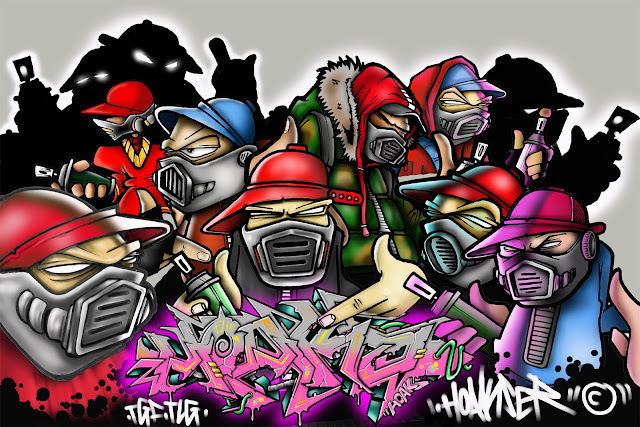 There will also be a small competition running for the best customized maskedmancan. I will notify the 20 buyers who get this limited edition piece of the prize, rules and deadline..
To take a closer look, and to snap one up please visit my store HERE..
u r burner man i love doin characters to! ther not as good but im neva givin up on em haha can u help me wif som pointers to always make a head/face look u kno right some times theyre a bit of angle like do u start by puttin circles down or...? any help would be much appreciaated man and plz dont stop! lol where can i see some of ur werk like in person? are u in aus or?